There are well over 1,000 MSN programs across the country, offered at a breadth of top-tier colleges and universities. The program typically takes two years to complete full-time or three to four years to complete part-time. While the full curriculum depends on the area of specialization, all MSN programs have three components: the graduate nursing core, the advanced practice nursing core, and the specialty curriculum content. The American Association of Colleges of Nursing (AACN) states that the graduate nursing core is the foundational curriculum content, deemed essential for all students who pursue a master's degree in nursing. The advanced practice nursing core enables graduates to provide direct patient services at an advanced level. The specialty curriculum content is a collection of clinical and didactic learning experiences defined by the relevant specialty nursing organization. Core MSN courses include nursing scholarship, nursing leadership, health systems innovation, health promotions for populations, and graduate statistics. Advanced practice nursing courses include graduate-level versions of health assessment, pharmacology, therapeutics, and pathophysiology. The specialty curriculum will depend on the student’s area of specialization, such as clinical nurse specialist, nurse practitioner, nurse anesthetist, or nurse midwife. 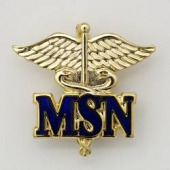 Upon completion of the MSN program, graduates must pass a national certification exam to use the APRN title. MSN admissions requirements vary by school but, in general, most APRN programs prefer candidates who already hold a bachelor’s degree in nursing. Some schools require a satisfactory Graduate Record Exam (GRE) score as well as professional experience and references. Since all candidates must hold licensure as a registered nurse (RN) before pursuing advanced practice education, some direct-entry MSN programs accept non-nurses and train them to pass the National Council Licensure Examination (NCLEX) during the first year of study. Tuition costs for MSN programs vary greatly by school, region of the country, and residence status. For example, in-state MSN students at UCLA’s School of Nursing will pay annual tuition of ~$26,000, while nonresidents will pay ~$38,000. We reviewed tuition costs for dozens of MSN programs, and we found that they generally cost between $25,000 and $50,000 per year. A successful career as an advanced practice registered nurse starts with a master of science in nursing degree. Browse our directory to find the best MSN programs in your local area.